Nothing is more important to us than preserving your teeth for life. Preventive Dentistry is the foundation of our practice. We strive to discover and correct any potential problem before it can deteriorate. Always, our goal is to get it right as early as possible and then maintain it. In our quest to provide the best dental facility and dental materials, we didn’t forget the most important factor -the human touch. We offer a friendly smile and refreshments when you arrive, hand-picked music throughout the office and the freedom to walk about. The intimate patient lounge where you can make phone calls or relax is also available. 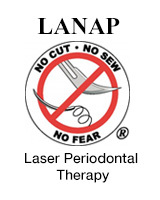 It is the utmost in dentistry combined with the utmost in comfort. And it shows in every smile that leaves our office.